Noted Medical Oncologists, Dr. Vishwanath Sathyanarayanan and Dr. Vinayak Maka pick 2 India-relevant studies in breast and nasopharyngeal cancers and an Indian study on olanzapine, presented at this year's ESMO (European Society of Medical Oncology) Asia 2018, providing their key takeaway messages. At the recent ESMO Asia 2018 Congress held at Singapore between 23 to 25 November, there were around 570 abstracts submitted and presented consisting of clinical trial data with a focus on Asian subpopulation, local epidemiological data, and translational oncology research. Here we focus on a few selected abstracts for their relevance to Indian oncology practice. Dr. Vinayak: In India, we have been using CDK inhibitor Palbociclib with reasonably improved outcomes. These results will help guide clinicians in India to use recently available Ribociclib as reasonable alternative combination therapy. In the Phase III MONALEESA-7 trial, Ribociclib (RIB) + non-steroidal aromatase inhibitor (NSAI)/tamoxifen (TAM) + goserelin (GOS) prolonged progression-free survival (PFS) vs placebo (PBO) + NSAI/TAM + GOS in premenopausal patients (pts) with HR+, HER2– advanced breast cancer. A preplanned analysis from a subset of Asian patients was presented at the ESMO 2018 conference which concluded recently. Primary endpoint was PFS, and secondary endpoints included overall response rate (ORR), clinical benefit rate (CBR), and safety. The Asian and Non- Asian patients were well matched. Dr. Vishwanath: The gut microbiota of every individual is unique. It can heavily contribute to how a person fights disease, digests food, and even their mood and psychological processes. Manipulation of the gut microbiota as a potential therapeutic option will require such studies in Indian population as well. Dr. Vinayak: This study is addressing the unmet needs in supportive care measures for radiation-induced oral mucositis in patients with concurrent chemoradiotherapy. Quality of evidence generated will help our clinicians to explore this option into practice. To determine the effect of the probiotic combination on radiation-induced oral mucositis in nasopharyngeal cancer (NPC) patients with concurrent chemoradiotherapy. Patients taking probiotic combination showed significant reduction of oral mucositis (1.35 vs. 2.47, p < 0.001), while the tumour response was similar to the patients in the control group (0.885 vs. 0.875, p > 0.999). Probiotic combination significantly enhances the patients' immune response and reduce the incidence of oral mucositis through modification of gut microbiota. Dr. Vishwanath: Olanzapine seems to be a good adjuvant to prevent CINV when added to other drugs. Moreover, it is bio-economical and safe. Several clinicians in India have been using this drug to prevent CINV and this study re-emphasises that. Dr. Vinayak: There were 52 abstracts were submitted from India, five abstracts were presented as oral papers. Among these studies, this study explores the utility of Olanzapine as a supplement to standard regimes. In a randomised study, three regimens for CINV in various combinations of olanzapine (O), dexamethasone (D), aprepitant (A) and 5-HT3 antagonist (H). The groups were Group A (AHD), Group B (AHDO) & Group C (HDO). Patients receiving cisplatin, cyclophosphamide–doxorubicin & any other HEC as per guidelines were enrolled. The standard doses of the concomitant drugs were administered before and after chemotherapy. The two groups received 10 mg of olanzapine orally daily on day 1 through 4. The percentage of patients with control of acute and delayed emesis was better in arm B with patients achieving a more complete response. Dr. Vishwanath Sathyanarayan is a Medical Oncologist from Apollo Hospitals, Bangalore with a fellowship from MD Anderson Cancer Center. 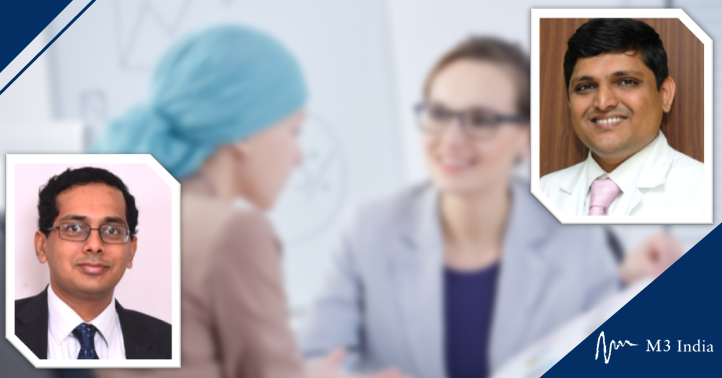 Dr. Vinayak Maka is a Senior Medical Oncologist who teaches and practice at the MS Ramaiah Medical College and the HCG MSR Cancer Centre, Bangalore.